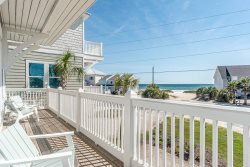 Latitude Adjustment is one of our newest vacation homes. It features 4 bedrooms, 4 bathrooms, and will sleep 15 guests. Enjoy the private pool and deck area. Latitude Adjustment has views from every direction! From the top look out of the crystal blue Gulf of Mexico, spin around and enjoy the golf course view behind you. As you enter the newly built Latitude Adjustment luxury vacation home, you will notice a bright open floor plan. The first floor living area has plenty of comfy seating (including two sleeper sofa’s), a large flat screen TV, and an electronic fireplace. This area opens to the fully stocked kitchen with a natural gas cook-top stove and stainless-steel appliances. The dining area is very well lit and will seat 8 guests and there are an additional five stools at the kitchen bar area. Down the hallway is a queen-sized bedroom with flat screen TV and a view of the large pool area. There is also a bathroom with a tub/shower combination and a spacious washer/dryer laundry area on this floor. The back door will lead straight onto the large pool deck and lounge area. Head up to the second floor of Latitude Adjustment and you will find an additional living area, three bedrooms, and three more bathrooms. The second living area has seating (including a sleeper sofa), a large flat screen TV, and a twin over twin bunk nook. Just off this area is access to the second-floor balcony where you can catch beautiful scenic views of Panama City Beach. There are two bedrooms on this floor that feature a full over queen bunk bed, each room sleeping up to 4 guests. These rooms share the spacious hall bathroom with a double vanity and large walk-in shower. Walk up to the third floor and you will see a wide-open entertainment and hangout area with many views. You will get to enjoy two couches, two large flat screen TV’s, and a mini-bar area, perfect for the group to gather. There are terraces on opposite ends where you can catch a glimpse of the pool area and golf course or the beautiful Gulf of Mexico. Book Latitude Adjustment today to start an unforgettable vacation in Panama City Beach! The whole experience with Holiday Beach Rentals was wonderful. They met every need and strived to make sure we had the best experience! Latitude Adjustment was the perfect house for our vacation! It's absolutely beautiful! The owner put so much thought into every detail. The pool is everything and the location and access to beach couldn't be better! We will definitely be booking this house every year! $1000 security deposit will be refunded upon check out after an inspection of property is made and zero damage or a violation of the rental agreement has occurred.